Amitriptyline is a tricyclic antidepressant. It is used to treat certain behavior problems such as separation anxiety, fear of noises and anxiety in dogs as well as urinating out of the litter box, spraying and anxiety in cats. Amitriptyline is a tricyclic antidepressant. It’s used to treat certain behavioral problems, such as separation anxiety, fear of noises, and anxiety in dogs, and urinating out of the litter box, spraying, and anxiety in cats. Amitriptyline requires a prescription from your veterinarian. Amitriptyline is a prescription medication not FDA approved for veterinary use; however, it is a commonly accepted practice for veterinarians to use this medication in dogs and cats. Amitriptyline is available as 10mg, 25mg, 50mg and 75mg tablets. The usual initial dose for dogs is 0.5-2mg per pound every 8-12 hours. The usual dose in cats is 5-10mg per cat once a day, at night. This medication may not help symptoms right away. It may take a number of days before symptoms begin to lessen. Contact your veterinarian if symptoms get worse or if new symptoms develop while the pet is on this medication. Amitriptyline may cause drowsiness or dizziness. Amitriptyline is a Tricyclic antidepressant. Amitriptyline affects chemicals in the brain that may become unbalanced leading to behavioral problems in dogs and cats. Amitriptyline is used in dogs to treat conditions such as separation anxiety, anxiety and fear of noise. In cats, amitriptyline is used to treat conditions such as urinating outside of the litter box, spraying, excessive grooming and anxiety. Amitriptyline may also be used for purposes other than those listed in this guide. Do not give this medication if your pet has taken or used a monoamine oxidase inhibitor (MAOI) such as selegiline, Mitaban Dip or Preventic Collar within the last 14 days. Tell your veterinarian if your pet has liver or kidney disease; asthma; thyroid disease; diabetes; stomach or intestinal problems; high blood pressure or heart disease; difficulty urinating, or glaucoma. Tell your veterinarian if the pet is pregnant or lactating. Give this medication exactly as directed by your veterinarian. Allow pet to drink plenty of water. If you do not understand the directions ask the pharmacist or veterinarian to explain them to you. Do not stop giving amitriptyline suddenly. This could cause symptoms such as nausea, headache and malaise. Store amitriptyline at room temperature away from moisture and heat. Keep this medication away from children and pets. Seek emergency veterinary medical treatment. Symptoms of amitriptyline overdose include seizures, confusion, drowsiness, agitation, hallucinations and low blood pressure (dizziness, fatigue, fainting). 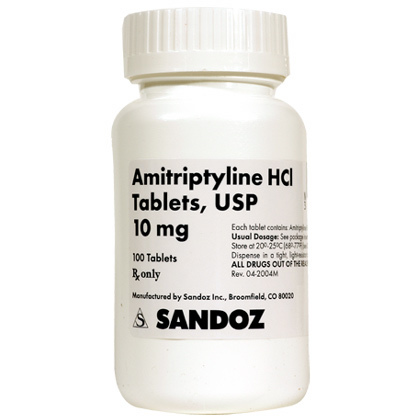 Amitriptyline may cause dizziness or drowsiness. If any of the following serious side effects occur, stop giving amitriptyline and seek emergency veterinary medical attention; an allergic reaction (difficulty breathing; swelling of the lips, tongue or face, or hives); seizures; a fast or irregular heartbeat; high blood pressure; difficulty urinating; panting, muscle stiffness or severe muscle weakness. Other less serious side effects may occur. Continue giving amitriptyline and talk to your veterinarian if your pet has drowsiness or dizziness; dry mouth and eyes; constipation; panting; mild agitation, weakness or headache; nausea or loss of weight or appetite. Other side effects may also occur. Talk to your veterinarian about any side effect that seems unusual or bothersome to the animal. Do not give this medication if your pet has taken or used a monoamine oxidase inhibitor (MAOI) such as selegiline, Mitaban Dip or Preventic Collar within the last 14 days. Amitriptyline may increase the effects of other drugs that may cause drowsiness, including other antidepressants, antihistamines, sedatives, pain relievers, anxiety medications, and muscle relaxants. Drugs other than those listed may also interact with amitriptyline. Talk to your veterinarian or pharmacist before giving any prescription or over the counter medicines including herbal products.